All of the programs are high quality, instructor-led programs. Each program includes conditioning, footwork, bladework, drills, and bouting. In foil, touches are scored only with the tip of the blade. Only the torso is valid target area. Foil and saber have "right of way" rules which determine who receives a touch. 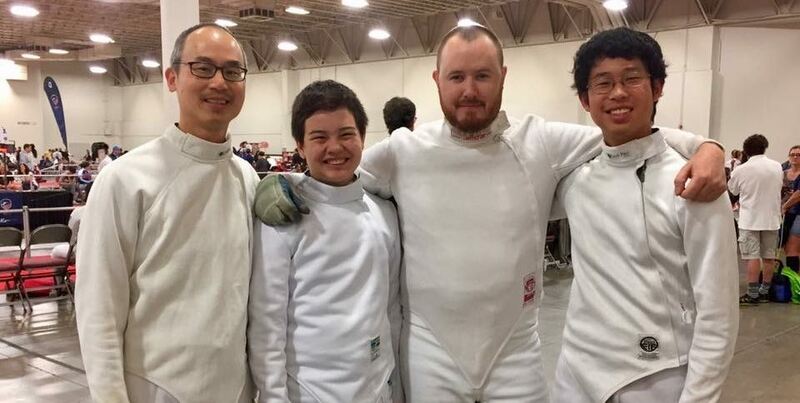 New and less experienced fencers will start with the Beginning Foil class and, depending on the level of their participation and goals, move on to Intermediate, and then the Competitive Class. As their skills improve, those interested in high level training and significant competition may enroll in the Elite Program. Touches in epee are also only scored with the tip of the blade; however, unlike foil, the entire body is valid target area. In contrast with foil and saber, there are no right of way rules for epee. This is the traditional dueling weapon. Coach Dana Sanford is our Head Epee Coach and teaches our Beginning Epee class. Open epee times (usually Thursday evenings) and private lessons are available. In saber, both the tip and the edge of the blade can be used to score touches. Everything above the waist is target except for the back of the head and the hands. Saber is the fastest of the three disciplines. Coach Joe Jasper teaches an Beginning Fencing (all three weapons-foil, epee, and saber) class on Saturday mornings. Coach Joe will also provide private saber lessons.